Happy Cinco de Mayo everyone! If you are looking for good places to drink tonight check out this list from Gothamist! For those of you who are not of the tequila persuasion I also have two events to add to this week’s roster. 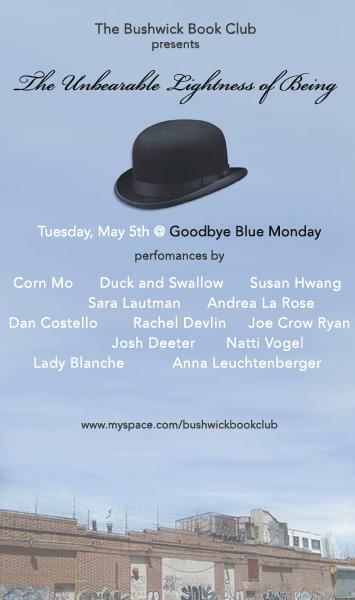 Tonight the Bushwick Book Club is mulling over the meaning, or lack of meaning, in Kundera’s novel ‘The Unbearable Lightness of Being.’ The last time I mentioned this lovely gathering they were discussing ‘James and the Giant Peach.’ If you missed that event you should definitely head over to Goodbye Blue Monday tonight! On Thursday my friend C will demonstrate yet another facet of her creative talents; I told you all about her burlesque career and now you can see her reincarnated as 1/3 of the awesome new band Heliotropes. 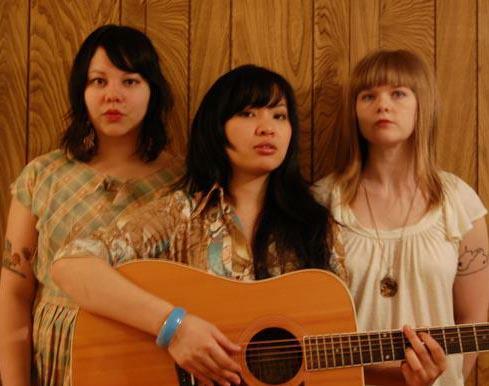 They’ll be playing at Matchless along with Astrid Pierce, Beloved Rouge and Himalaya– HOT. Enjoy your week and stay tuned for even more additions! This entry was posted in Upcoming Events to Consider and tagged Astrid Pierce, Beloved Rouge, Bushwick Book Club, Cinco de Mayo, Goodbye Blue Monday, Gothamist, Heliotropes, Himalaya, Kundera, Matchless, The Unbearable Lightness of Being on May 5, 2009 by thebigredapple.